Share Sweetest Day with a loved one with Dine’s three-course prix fixe menu, available Saturday, Oct. 17. For $45 per person or $90 per couple, begin with a choice of either Crab Bisque with crème fraiche or Mizuna and Frisee, cucumber, grape tomato, goat cheese and sweet lemon vinaigrette. For the main course, enjoy Surf & Turf, a petite filet with porcini mushroom red wine reduction, shrimp and crab wrapped with peppered bacon, sweet potato puree and asparagus. 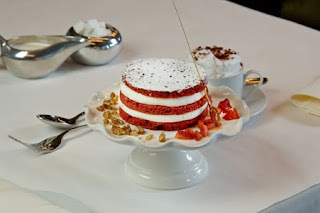 Indulge in Red Velvet Cake for Two for dessert.